Petzl ASCENSION Ascender. 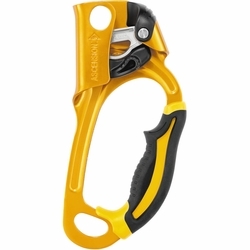 Handled rope clamp for rope ascents, the ASCENSION features an overmolded grip and ergonomic upper part for a comfortable and powerful grip when pulling with one or two hands. The ASCENSION handled rope clamp has a wide lower hole for easily attaching two carabiners for a lanyard and footloop. Wide opening allows the handle to be easily grasped, even with thick gloves.